With its grandiose architecture and myriad pops of bright color, Seville’s Plaza de España is the stuff dreams (and once-in-a-lifetime photo ops) are made of. Yes, every guidebook lists it as a must-see in the Andalusian capital — and for good reason — but it’s so much more than just a stunning cultural icon. Here’s what you need to know before visiting the most emblematic square in Seville in order to fully appreciate its beauty and wonder. The semicircular plaza springing up from among the lush greenery in Maria Luisa Park may seem as if it’s been around forever with its blend of Renaissance and Moorish-inspired architectural styles. Believe it or not, though, Seville’s most recognizable square is also one of the city’s newest (relatively speaking). It’s less than 100 years old! Seville-born architect Aníbal González designed the Plaza especially for the 1929 Ibero-American Exposition which was held in the city. The event was designed to bring Spain together with its former Latin American colonies by sharing culture and promoting positive relationships among the participating countries. Plaza de España was the crown jewel of the exhibition. Its aim was to represent the grandeur and beauty of the event’s host city, as well as that of Spain itself. Today, the lavish square retains its undeniable beauty while remaining a favorite spot in the city for locals and visitors alike. Its irresistible charm has even caught Hollywood’s eye, and you can spot it in several movies such as "Lawrence of Arabia" and "Star Wars Episode II: Attack of the Clones." The miniature canal snaking around the interior of Plaza de España offers the chance to relax and enjoy the Seville sunshine while taking in the stunning views of the plaza. Boat rentals cost 6 euros for 35 minutes and take you on a leisurely ride along the 515-meter canal. You’ll pass beneath the plaza’s four emblematic bridges, which represent Spain’s four ancient kingdoms: Castile, León, Aragon, and Navarre. As its name (“Spain Square”) implies, Plaza de España was designed to be representative of the entire country. Surrounding the interior rim of the plaza are 48 colorful alcoves with benches, each representing a different province of Spain. Each mini-pavilion includes a gorgeous depiction of history from that area, as well as a map showing its location within Spain. It’s practically a rite of passage for Spanish visitors to find the little corner representing their home province and take a picture in front of it. 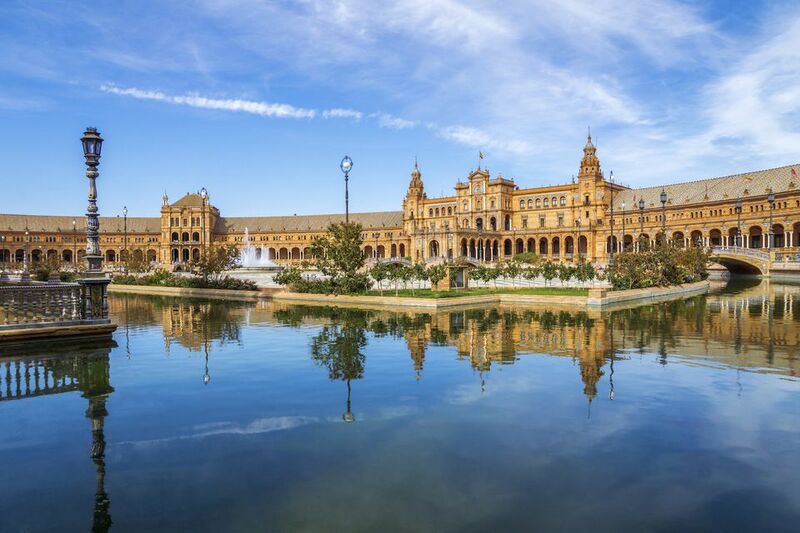 If you've visited a Spanish destination that stole your heart before visiting Seville, seek out its alcove at Plaza de España and snap a picture of your own. Plaza de España is located right in the middle of Maria Luisa Park, one of Seville’s many gorgeous green spaces and a relaxing place for a stroll. You can reach the park on foot in less than 20 minutes from the cathedral and the lively Santa Cruz neighborhood. If you’re tired from exploring and prefer to take public transport, take bus line C4 and get off at the Prado de San Sebastian stop. From there, the park and plaza are just around the corner. You can also take the tram from Plaza Nueva (there is only one tram line) to Prado de San Sebastian or the San Bernardo train station and walk to the plaza easily from there. Besides taking a relaxing walk in gorgeous Maria Luisa Park, there are a number of other things to do just a stone’s throw away from Plaza de España. Check out the Royal Tobacco Factory, a neoclassical building with a storied past (the opera "Carmen" even takes place here). The luxurious Hotel Alfonso XIII nearby is also worth a visit. Even if you’re not a guest, you can walk through the lobby and the ground floor marveling at the gorgeous architecture and interior design of the historic hotel. About a 10 minute walk away, you’ll find another of Seville’s most emblematic and iconic sights: the Royal Alcazar. This historic palace-fortress gained international renown when it appeared on a recent season of "Game of Thrones," but the majestic complex is worth a visit for the centuries worth of history it holds. Be sure to reserve your ticket online before visiting, as the lines can get quite long the day of.